:: $20 less expensive during the week. :: The cost over a longer period depends on the duration of your stay. Deposit 50% by bank transfer, balance payable on arrival. If less than seven days notice of cancellation is provided, full payment must be made. If you arrive on the day and decide it is not for you, we will still require full payment. LESS THAN SEVEN DAYS NOTICE FULL PAYMENT. Enjoy your own ten acres with access to wheeny creek (200 metres of rugged walk). Cedar Ridge Road is a no through road with little noise. If you like a bush setting that is tranquil and comfortable, this getaway is for you. 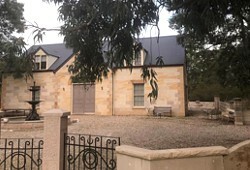 It is ten minutes to Kurrajong village with most amenities. Breakfast is provided, in your own fridge and includes bacon and eggs, cereal, fruit juice and fresh fruit. Bread, milk and the normal additions including tea and coffee. The Suites have a kitchenette and a full equipped kitchen downstairs. 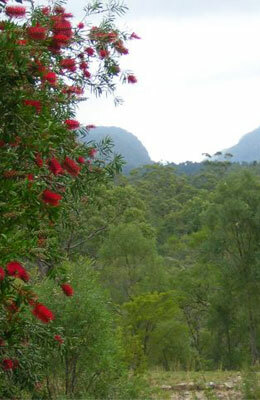 The ten acres is surrounded by Wollemi national park on three sides. A stunning piece of paradise, hosted by two wonderful people. We had a magical time, everything about the stay was perfect. Thanks again for your hospitality. We look forward to returning. It was hard to leave. What a little piece of Heaven. We had such a relaxing time . It ticked all the boxes, quiet,nature, double spa,and open fireplace. In particular a comfy bed only 80 minutes from Sydney. This is our third visit and we love it so much. Everything is perfect and homely. The generosity of our hosts is so welcoming. The fireplace is like no other I’ve ever seen and the carving above the fireplace is beautiful. Absolutely love it here, wish we could stay longer. Thank you for providing the Perfect venue to hold our wedding. Beautiful was the word on everyone's lips. Highly recommended for future ventures. A secret treasure in this beautiful location. So quiet and serene. Beautiful home, amazing layout, just perfect for a getaway. A trip into a magic world. Beautifully done.